Contact Us │ Richard D. Byler, D.D.S. Contact the Office of Richard D. Byler, D.D.S. today! 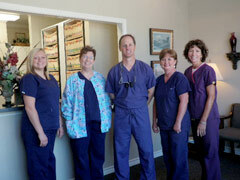 Our dental team understands how difficult it can be to choose a dentist. With so many options, picking the right one can be very hard to do. With years of experience and a state-of-the-art facility, you can trust Richard D. Byler, D.D.S. to take care of all of your dental care needs. Dr. Byler is proud to provide his patients with the exceptional, gentle care they deserve. If you have any questions or concerns, call our office at 936-634-3431 or fill out the information below and a member of our team will get in contact with you as soon as possible.